What this poor boy goes through to be a better version of himself, is both sad and downright funny. 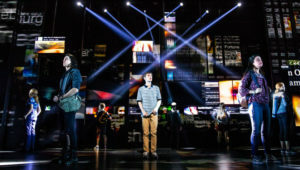 Meet anxiety ridden teen Evan Hansen (Ben Levi Ross is excellent) driving himself crazy about returning to high school as a senior. His mother Heidi (Jessica Phillips) suggests that he allow his friends to sign the cast. He broke his arm falling from a tree during the summer break. The only friend he does have, Jared Goldsmith (Jared Kleinman is hysterical with his rapid-fire responses) is too busy to notice Evan’s cast and doesn’t sign it. Evan’s therapist strongly advised him to write a letter to himself daily about how good the day will be. He does so and eagerly awaits for the big moment to come, and that all good things will happen. Evan gets his wish, but, it becomes more than he ever expected. Evan writes himself a letter saying that he knows that nothing will change and if no one would notice if he wasn’t around. The only happiness he gets is seeing his crush Zoe Murphy (Maggie McKenna). Evan prints his most recent letter from the school’s printer. Then, Connor Murphy (Marrick Smith is so cool in this role) comes in. He wants to sign Evan’s cast. Connor grabs the letter from the printer to give to Evan but he reads it and is bothered by the mention of his sister Zoe’s name. He takes his frustration out on Evan and marches out with the letter. Now Evan is more anxious about what Connor might say or do. It turns out he does a lot without even trying. The school mourns Connor’s death who committed suicide. They find Evan’s letter on Connor’s body. The letter is mistaken for Evan by Connor. Soon, the Murphy family invite Evan for dinner. They are hoping that Evan can answer some questions regarding their child’s death. Jared previously, instructs Evan to simply “nod and confirm” whatever they say. It’s not directly lying but not exactly telling the truth. Evan does the nodding and confirming and finds himself in the middle of an emotional vortex he can’t escape. Now, everyone in school knows who he is, Connor Murphy’s best friend. From there it escalates to an homage to the young man. Evan, Jared and peer Alana Beck (Phoebe Koyabe) create The Connor Project, whose goal is keeping Connor’s memory alive. Slowly, it appears that Connor’s death is losing momentum. The Connor Project prevents that atrocity from becoming permanent. At Connor’s memorial, Evan gives the speech. Touching everybody with his words, the Murphy’s are so grateful they wish to give Connor’s college money to Evan. Then, it gets more entangled when Heidi finds out what her son has been up to. For once, she takes charge of her family and tells Evan he must tell the truth. Playwright Steven Levenson does a remarkable job in creating a rich story that everyone can relate. His characters have heart and decency. Sure, there are some with questionable morals but who doesn’t already know someone like that in real life or is that person? That’s not a crime, just bad judgment. Along with fabulous music and lyrics by Benj Pasek and Justin Paul, the story works and gels wonderfully. It reminds us how being a teenager was a special, chaotic, a once in a lifetime experience that most of us don’t need to repeat. But, it’s okay to look back and see how we used to be and take note at what we became.